Wind chill around 20 with northwest gusts to 35 mph. Sun with temperatures falling through the 30s. Overnight Friday: Clear, bitter cold. Lows in the 20s with wind chill in the single digits. An arctic blast will be knocking on our doorstep overnight tonight into tomorrow morning. This powerful cold front will not only bring near record cold to New England, it will also bring strong winds with gusts up to 45 mph possible Friday. 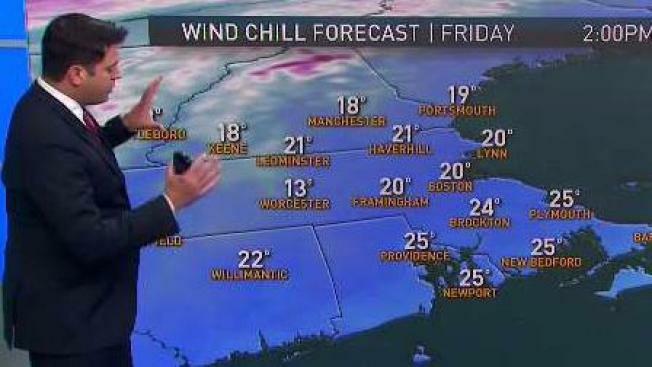 This has prompted a Wind Advisory for most of New England, and with a wind out of the northwest, you can expect dangerously cold wind chills into the teens and single digits Friday night. A Winter Weather Advisory has also been issued for the Crown of Maine as snow squalls are expected along this front after midnight and through 8am Friday morning, reducing visibility, creating icy roadways, and some snow accumulation. One to 3 inches of snow is possible in far northern New England including northern New Hampshire, northeast Vermont, and northern Maine. Not everyone will see snow, but everyone will feel the arctic blast. After the cold front clears the region by 11 a.m. Friday, skies will start to clear and temperatures will start to take a tumble. The high temperatures tomorrow will be observed in the morning hours. By midday, temperatures will already be in the upper teens along the Canadian border and into the 20s-low 30s elsewhere. By 5 p.m. Friday evening, temperatures will be in the 20s for most, with a few areas north into the mid to upper teens. The cold will continue to sink southward Friday night into early Saturday with most locations sliding into the teens for overnight lows. Saturday afternoon brings high temperatures back into the mid to upper 30s and Sunday features a slight warm-up with highs into low to mid 40s under a mix of sun and clouds. Monday features the next chance for scattered rain showers with highs into the mid to upper 40s. Be sure to stay up to date with the very latest weather updates on the air, online, and on-the-go with the NBC Boston/necn app.